Israeli military forces evicted Palestinian farmers and over 100 international activists from olive groves near the illegal Israeli settlement of Qedumim on 24th October. 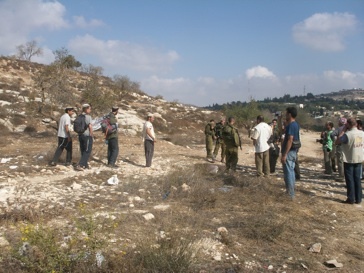 Farmers and accompanying activists attempted to enter the lands of Kufr Qeddum farmer, Faruq Abdl Karim Barhum, early on Friday morning, to harvest olives, but were denied entry to the lands when Israeli authorities declared the area a closed military zone. 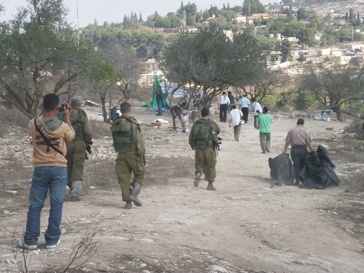 Farmers and activists then attempted to harvest olives on nearby lands belonging to Kufr Qeddum mayor, Mohammad Abu Nimah – lands which have been occupied by Qedumim’s “hilltop youth” – a violent, right-wing faction of the settlement movement. 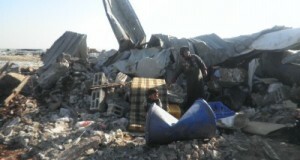 Quickly, settlers from Qedumim flooded the area in an attempt to intimidate the farmers and activists. 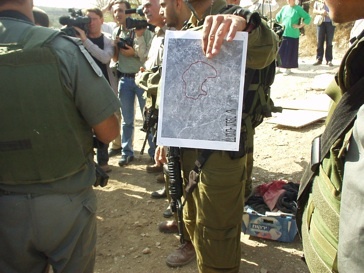 Spokespeople for the settlement – self-described as “The Vanguard of Jewish Resettlement in Samaria” – publicly insisted that Palestinian farmers were terrorists and terrorist sympathizers and needed Israeli military permission to gain access to their lands. Israeli soldiers then proceeded to push the farmers and activists off the land, detaining one Palestinian farmer, Mohammad Abeid; releasing him only after activists crowded around the jeep. Faruq Barhum has been trying to harvest his olives for over one week. On Saturday 18th October, Faruq and his family were forced off their land near the illegal Israeli settlement of Qedumim by Israeli soldiers, under the pretext that it was Shabbat – a holy day in Judaism – and a day when Palestinian farmers are regularly denied access to their lands. The soldiers assured Faruq and his family that they would be allowed to harvest the olives the following day. The next day, Faruq, along with international activists and Israeli peace groups, again attempted to harvest his olives, but armed Israeli settlers from Qedumim quickly appeared, followed by Israeli police and military. 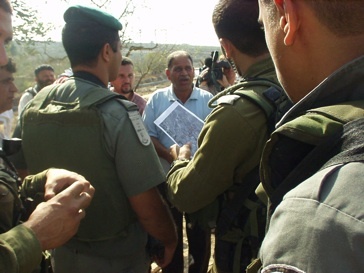 Rather than protecting the Palestinian farmers, as is their duty under Israeli and international law, the Israeli authorities implemented a closed military zone, and again forced Faruq off his land, arresting one Israeli and three international activists in the process. The pretext for this eviction was that Faruq and his family require co-ordination with the Israeli District Coordination Office (DCO) to enter their own lands. Faruq was then informed that he would not be able to access his lands until 9th November. 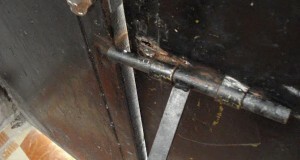 The family was extremely upset by the prospect of not being allowed to harvest their olives until such a late date (the official start date for the olive harvest this year was 10th October) for a number of reasons; the first of which being the concern that the olives will spoil – especially if it rains. With black clouds rolling over the nothern West Bank, the potential of this outcome seems highly likely. The Barhum family are also extremely concerned that the Israeli settlers will steal their olives. Another piece of land close to Qedumim belonging to the Barhum family was recently stolen when, after Faruq plowed the land to prepare it for planting, settlers planted their own olive trees in the land, thus effectively stealing it. 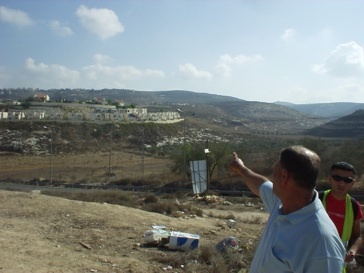 Indeed, the former mayor of Qedumim, Daniela Weiss, openly stated that the family’s remaining land belongs to the settlement. The implementation of “closed military zones” is a common tactic used by Israeli occupation authorities to keep Palestinian farmers from their lands. Palestinian farmers are routinely evicted from lands which lie close to illegal Israeli settlements, a process which not only denies farmers their livelihoods, but also facilitates the annexation of further Palestinian lands by Israeli settlers. According to the Israeli human rights group B’tselem, more than fifty percent of the West Bank has been expropriated from Palestinians – mostly for settlements and future settlement expansion.